Charlotte Join-In Wine Tours: Get Social! Wine Me Down is Charlotte's exclusive full service wine country tour guide and concierge to explore Charlotte wine country for NC wine tasting at Charlotte area vineyard and winery destinations. Charlotte corporate and private groups enjoy an all-inclusive Charlotte wine tasting event planner for groups wanting to do a wine tasting corporate, sales appreciation, or teambuilding event. 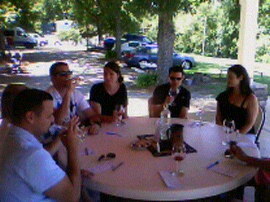 Book a private Charlotte wine tour for your group! All wine tours based on bus seat availability.